Louis Ettlinger washed up on these American shores in the year 1866, aboard the ship Bremen. S.S. New York. A native of Carlsruhe, Germany, he was twenty years old and listed his occupation as “merchant”. Although he most certainly did achieve riches, there are no rags at the beginning of this story. The family was educated, enlightened and prosperous. His cousin Jacob Ettlinger was a prominent Rabbi, scholar and teacher who wrote numerous books and articles. Another cousin, Anna Ettlinger, was the noted feminist, professor of literature and confidante of Freud’s famous patient “Anna O.” (Bertha Pappenheim ). They lived in an environment where assimilation and acceptance seemed to be within their grasp. Why then, did young Louis leave behind his friends and family for a new world, one which author Samuel C. Heilman relates in “The Many Faces of Orthodoxy” was known to his peers as “trefe Medina,” an impure land where Jewish law was not followed? Perhaps it is because life in Carlsruhe was not all latkes and strudel for members of the Jewish community. Reconciling the laws of Judaism with an increasingly complex and secular society provided one set of challenges. Dealing with random and often violent intrusions from certain elements of that society provided another. Rabbi Jacob Ettlinger was one of the first German rabbis to attend a secular university. He was also forced to leave his studies at Wurzberg due to an anti-semitic uprising in 1817. 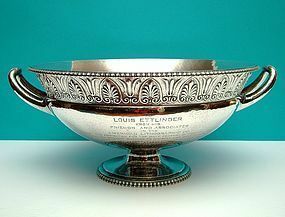 After arriving in New York, Ettlinger had a very brief stint as a grocer, but as shown in the inscription on this bowl, by 1867 he’d started a career in printing. He had the good sense and good fortune to concentrate on brilliantly colored and finely rendered cigar box labels at a time when demand for cigars was at an all time high. His establishment thrived. But our young protagonist was not content to run a substantial and successful printing business. Along with Joseph P. Knapp, he consolidated eight independent houses into a printer’s trust, incorporated as The American Lithographic Corporation, with an initial capitalization of some eleven and one half million dollars, which ultimately controlled over eighty percent of all printing done in the U.S. His official title was "treasurer," but in modern day terms one would have called him the CFO. At the time of his death, Ettlinger had a fine house in the east seventies, substantial interests in several corporations, and a world class collection of art. His estate was valued at over five million dollars. His daughter Flora Giles Whiting was an astute investor and collector of American furniture and artwork. Her taste and knowledge set the tone for an entire generation of connoisseurship, and the collection now forms the backbone of several museums. She also endowed a foundation in her name which has given away over fifty million dollars to scholars in the humanities, and is still going strong. She was not, however, raised as a person of the Jewish faith. Her marriage in 1899 to Giles Whiting was performed by the Reverend Charles H. Eaton. Their children were brought up as Presbyterians. Here then is an artifact of the Gilded Age, an uncommon intersection between the history of Robber Barons and German Jewry, but above all an exceptionally well designed and well executed piece of American silver, one which makes me want to grab a bag of citrus, a big bottle of Rioja and a splash of triple sec, mix up a batch of sangria, and serve it elegantly on a hot Summer evening.